The Mediterranean as it once was, is a phrase used by the Croatian tourist board, for this country, sitting oposite Italy on the Adriatic sea and extending upto the eastern edge of the Alps. 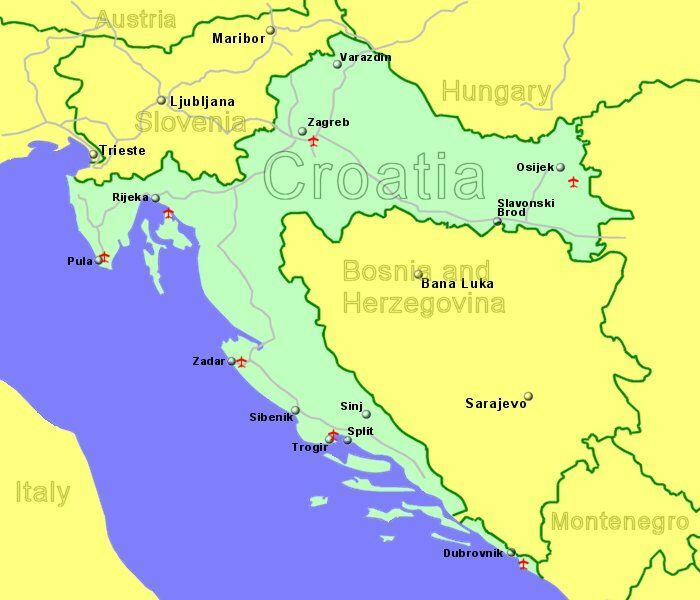 This is a diverse land with plains, lakes and rolling hills, densely wooded mountains, plus a rugged Adriatic coastline with a clear blue sea. It is also a place for sailing, amongst the many islands in that clear blue sea, diving, walking, climbing, riding, canoeing, white water rafting, caving - and more. Croatia has historic towns and cities to explore and is also a suitable destination for a number of activity holidays for those who don't simply want to enjoy the clear blue sea. The currency in Croatia is the Croatia Kuna (HRK). Located 20Km from Dubrovnik, on the Adriatic coast, south west Croatia. Dubrovnik (a UNESCO World Heritage Site) is a tranquil historic city hosting many musical, art and theatre events year round. Located 20Km south east of Rijeka, on the Adriatic coast of western Croatia. 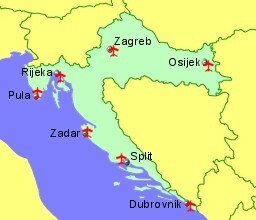 Rijeka is Croatias third largest city and main seaport. Located 25Km West of Split, Croatias second largest city, on the Adriatic west coast of Croatia with ferries connecting to the nearby Adriatic islands of Hvar, Brac, Vis, Lastovo. Located 8Km South East of Zagreb, the capital and largest city, central Croatia. Zagreb has been called the city of museums and is becoming a popular city destination.